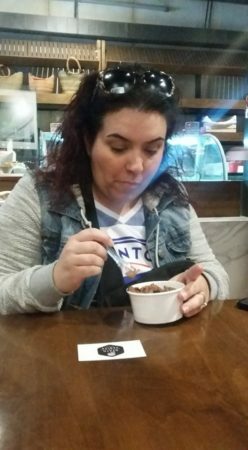 A little Momma Braga fact to all my amazing readers and fans is that I am a chocoholic. 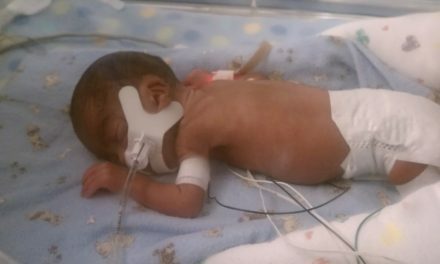 I have been since I could start eating chocolates and from what I can see from past photo albums, it started in my toddler years. 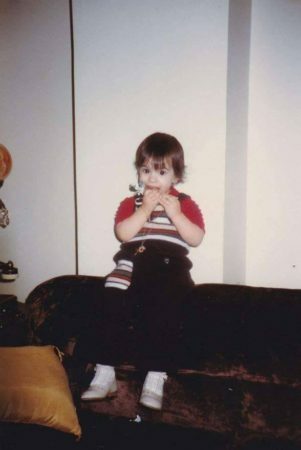 My toddler years with some great chocolate. The day finally arrived to find out what Tasty Tours and Toronto had to offer. 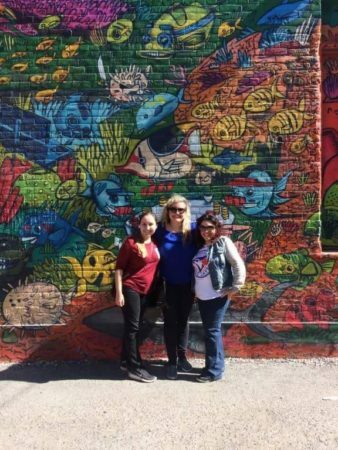 From left to right: Grace of The Baby Spot, Melanie of Momma Braga, Christy of The Baby Spot, and Jess of The Baby Spot. 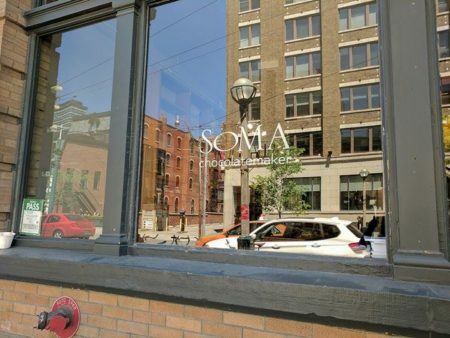 Our first stop was at 443 King Street West, at SOMA Chocolate where we first met with our tour guide, Alex, to learn a bit on the history of chocolate and our first sampling began. At this stop we tried two different types of chocolate, the first one was from Argentina and it reminded me of the chocolate Easter bunnies I would get as a kid and I loved it! The second chocolate was from Vietnam and it was a fruit like taste to it. Of course I loved this one too! It was hard to just pick one. 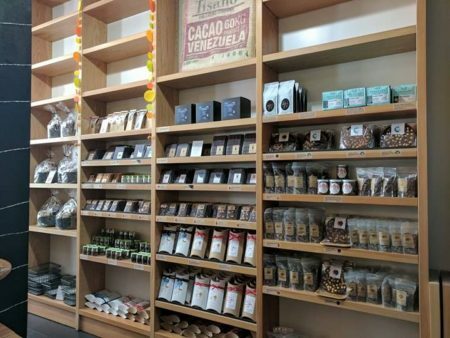 SOMA Chocolate was a neat and unique place to visit as you first enter the shop portion and then as you head back you can see a mini factory of where each chocolate is made. Have I mentioned yet that they create chocolate right from the cacao beans?! 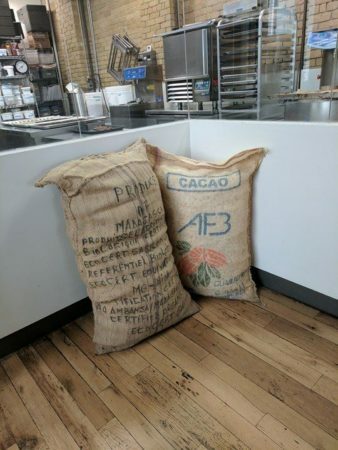 You can even see the bean sacks throughout the store. It is such an interesting place to visit and try their delightful chocolates. Feel free to follow them on Facebook, Twitter, and Instagram to see what they will be creating next. 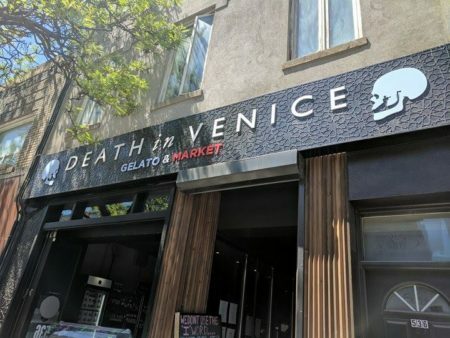 Death in Venice Gelato Co.
Our next stop on our tour was at 536 Queen Street West at Death in Venice Gelato Co and if you can guess by their name they do sell Gelato. Now this may surprise many of you but I have never had a Gelato and I am not sure why but I just haven’t. So this was my first opportunity to try one. Owner and Gelato Maker, Kaya Öğrüce first provided us with some information on his shop and then he showed us how gelato was made – very interesting process! Then it was time to be served with Chocolate Bourbon Gelato and it was delicious. I enjoyed it so much that I was one of the last to finish! If you feel like you have seen Kaya before, you probably have on Chopped Canada in season 3, episode 15 and he won. 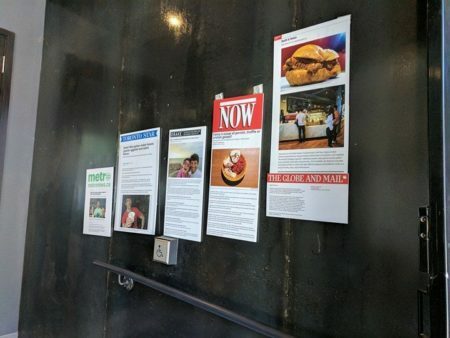 You can even see his successes in the front entrance as they are displayed proudly as they should be. Did I mention that they work with local farmers and suppliers in an effort to use exclusively fresh, local and seasonable ingredients?! They also produce a variety of dairy-free and vegan sorbetti. They also use coconut milk, rice milk and almond milk as an alternative to dairy. Most of their gelati and sorbetti are gluten free. 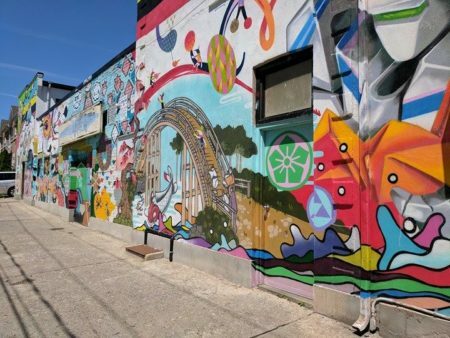 If you are in the Queen and Bathurst area, they are a must visit! Make sure to follow them on Twitter and Instagram as you don’t want to miss what they are up to. Sanko Trading Co. has been open since 1968 serving the Japanese community in Toronto with a wide range of Japanese groceries. Sanko is a one-stop shopping site for Japanese food and gifts stocked with hundreds of different types of spices, sauces and staples essential for the Japanese culinary experience. 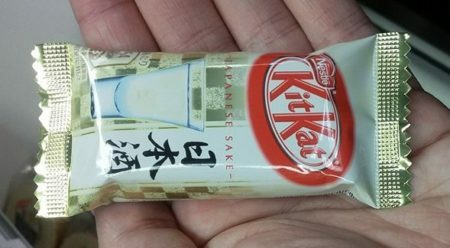 So what could Sanko provide to the Chocolate Tour, well, that is simple, Kit Kat “Japanese Sake” which is white chocolate with a wine flavor. Yes! You read that right, a wine tasting Kit Kat bar. But that is not the only flavor that they have in stock as they have several others such as green tea flavor. But on our tour we tried the Shake one and even though many enjoyed it, it wasn’t my cup of tea. I like my Kit Kat as chocolate only but I do recommend to try it as you don’t know if you may like it. Interesting fact! Japan has 235 different Kit Kat flavors! Wow! 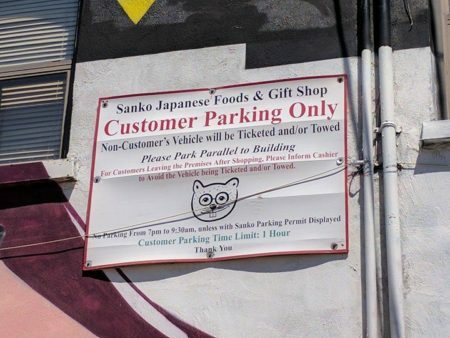 Sanko is definitely a unique place to check out especially with the great diversity in the city of Toronto. 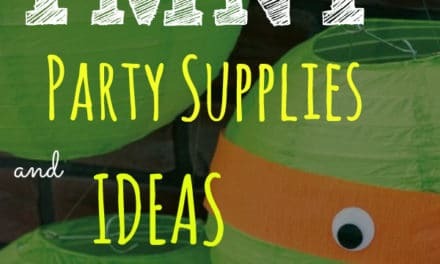 Make sure to follow them on Twitter, Facebook, and Pinterest. 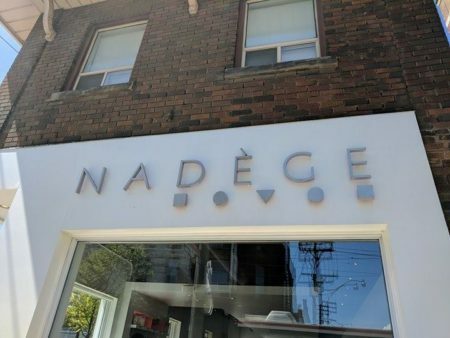 Our next stop wasn’t too far at 780 Queen Street West where we entered Nadège. This Patisserie shop in Toronto is owned by Chef Nadège Nourian. Since opening in 2009, she has delighted Torontonians with modern dessert creations. 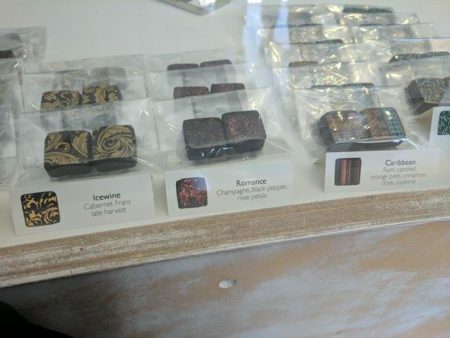 We tried two different types of chocolates and they were ok in my books. But the patisseries in the display cases looked amazing! 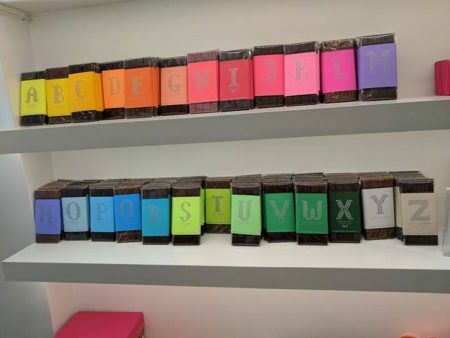 They even offer chocolate bars with each letter of the alphabet coinciding with the flavor starting with the letter. For example M was for Mint – interesting! Make sure to follow them on social media, Facebook, Twitter and Instagram. Our next stop involved a walk through a very popular park in Toronto called Trinity Bellwoods Park. It was a beautiful scenic route on a great sunny day that we were having. 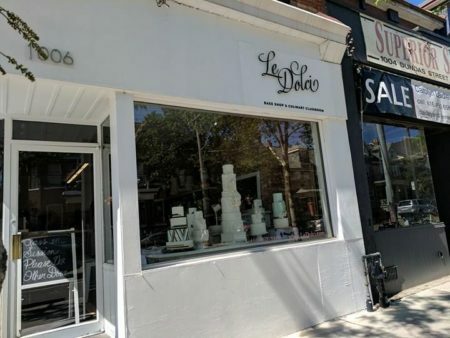 We then arrived at 1006 Dundas Street West where we saw Le Dolci. 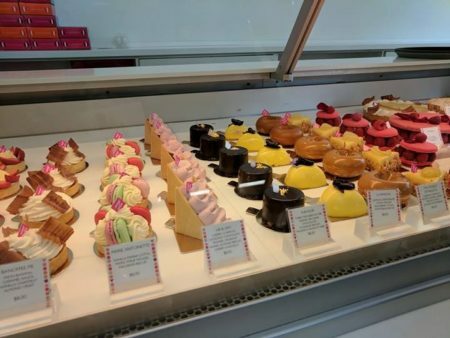 Le Dolci offers special occasion cakes, macarons, cupcakes, bakery cakes, wedding cakes, holiday and corporate treats, and sweet treats and gifts. All by the way, looking delicious. 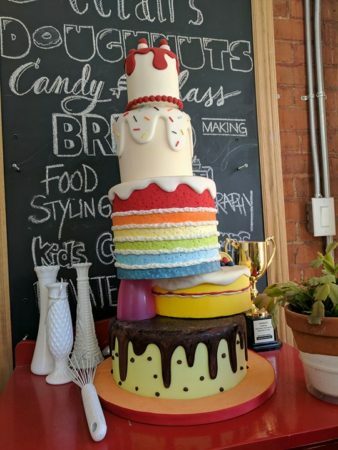 They also offer classes to teach how to design a cake of your very own – very neat! Today we were trying macarons and again this was a very first for me as I have never eaten one before. 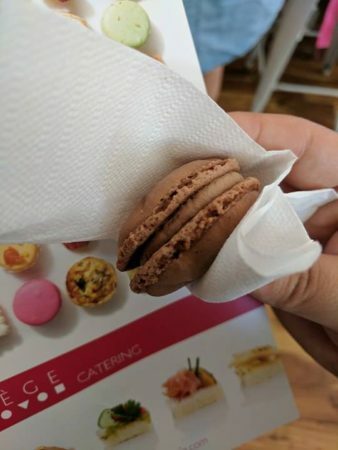 Since this was a chocolate tour, I tried the chocolate macaron and it was delicious! Make sure to follow them on Facebook, Twitter, Instagram and Pinterest. 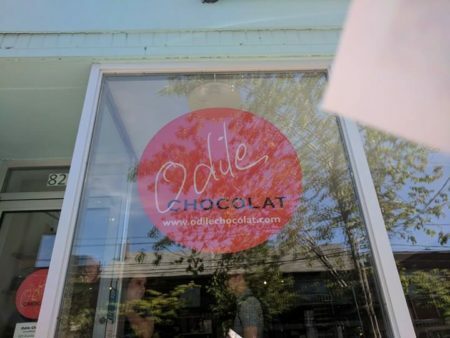 Last but not least we ended the tour at 829 Dundas Street West where we entered an adorable shop called, Odile Chocolat. We were greeted by owner and renowned food industry specialist, Odile Chatelain. Odile honed her craft while growing up as a child near Paris, France. She and her mother would make truffles each Christmas. This family tradition instilled a passion within Odile that has carried her through her 30-year career in the food industry. 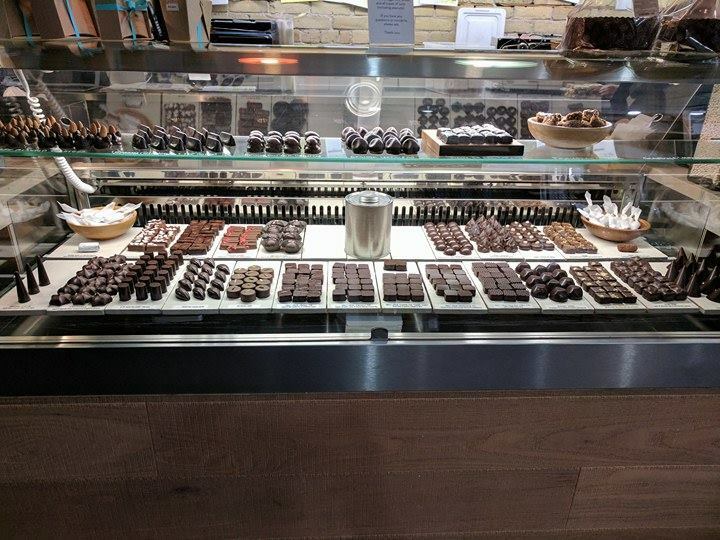 Odile now specialize in the latest food industry trends and brings exceptional quality European chocolate products to Torontonians. Odile Chocolat specializes in tantalizing hand-made truffles with a combination of wine, herbs, spices and flowers. 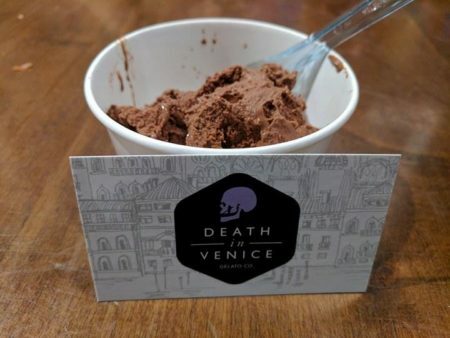 It really gives chocolate lovers a unique selection of flavor and choices. 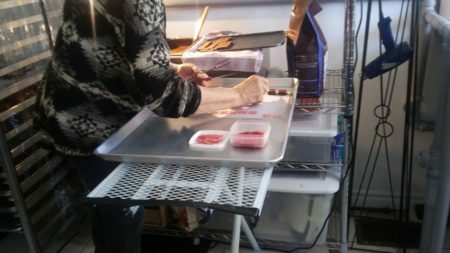 During our tour at Odile, she offered a demonstration on how she hand designs the chocolates, it is just spectacular to see! Make sure to follow Odile on Facebook and Twitter. Overall the chocolate tour was great and a unique experience. I got to sample a variety of different chocolates in varies locations and spend time with some amazing people. I also got to experience firsts that did not disappoint like the gelato and macaron (French spelling). 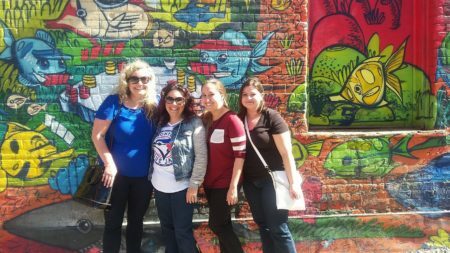 The walk through Toronto is the icing on the tour as you get to see the sights Toronto has to offer as you visit each of the shops. The beauty of Toronto is that every little inch of the city has it’s own feel to it. Momma Braga tip is to bring really comfortable shoes! Above all, I had an amazing time especially doing the tour with friends. I would recommend this tour as a girls day or even as an outing with your significant other. To purchase tickets please click here. 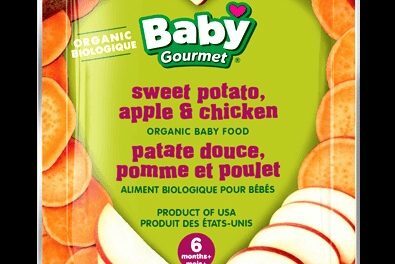 Special thank you to The Baby Spot and Tasty Tours Toronto for having Momma Braga to experience this tour.